This video makes you wonder if the engineer knew he was going 70 MPH! Looks like 170 mph! 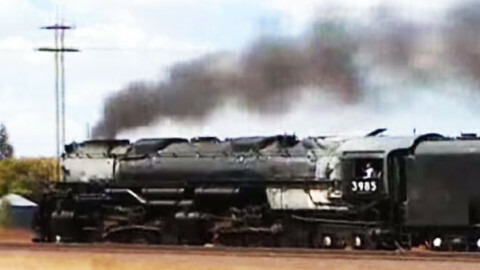 The UP 3985 was one of the Challenger series steam locomotives and built tough. A steam locomotive that was first built around the beginning of World War II in order to haul freight and passengers without helper engines, especially on steep 1.14% grades. Imagine our troops packed into her passenger cars being transported to their training destinations! Currently she is in the roundhouse in Cheyenne, Wyoming. Her last regular train service was in the late 1950’s. If you’ve ever taken a ride on the Union Pacific 3985 or a train like this let us know in the comments below! Would love to hear your experience on historic train.